The National Multistate Licensing System (NMLS) Loan Officer exam, also referred to as the National Test or SAFE Mortgage Loan Originator Test, is a state-administered test for candidates seeking state licensure as mortgage loan originators (MLO). The NMLS created the National Test in accordance with the Secure and Fair Enforcement for Mortgage Licensing Act of 2008 (SAFE). Every state in the United States must comply with SAFE; thus, everyone seeking state licensure as an MLO must pass the NMLS-developed SAFE Mortgage Loan Originator Test. Loan Officer Exam with Practice Questions! Prepare with our Loan Officer Study Guide and Practice Questions. Print or eBook. Guaranteed to raise your score. Get started today! How do I register to take the NMLS Loan Officer exam? First, you must create an account on the NMLS website, create a test enrollment window, accept the Candidate Test Security and Confidentiality Agreement, schedule a test date and testing center through Prometric, and arrive at the test center at least 30 minutes early with a government-issued photo ID card. Pre-licensure education does not need to be completed prior to testing; however, you may find that completing such education is helpful in successfully passing the National Test. Check the NMLS Education Page for information regarding approved educational providers and courses. MLO licensing requirements may differ by state. In some states, candidates may be required to take the National Component and the State Component of the NMLS SAFE test. Some states only require the National Test, and others have adopted the Uniform State Test. Check the NMLS Resource Center’s State Licensing website to find your state’s requirements and additional resources. How much does the NMLS Loan Officer exam cost? The NMLS National Test costs $110 at registration. You will need to pay this fee in order to create a test enrollment window on the NMLS website. What is the passing score for the NMLS Loan Officer exam? The SAFE Act of 2008 requires that all potential MLOs pass the NMLS National Test with a score of at least 75%. You will receive a score report immediately after completing the exam; however, this is not your official score. Your score will be considered official once it is posted to the NMLS site. What does the NMLS Loan Officer exam cover? Loan Officer Flashcards. Proven Loan Officer test flashcards raise your score on the Loan Officer test. Guaranteed. Subtopics: RESPA purpose and origin; defining terms (e., “mortgage broker”), etc. Borrower action notification; circumstances for denials; prohibitions and exceptions, etc. Finance charges and permissible fees; defining terms (e., “APR,” “business day,” “dwelling,” etc. ); Home Ownership and Equity Protection Act (HOEPA), etc. Borrower information; explanation of APR; violations of TRID; loan estimates, etc. Home Mortgage Disclosure Act (HMDA); Fair Credit Reporting Act (FCRA); Fair and Accurate Credit Transactions Act (FACTA), etc. Consumer Financial Protection Bureau (CFPB); Department of Housing and Urban Development (HUD), etc. APRs; conventional and conforming (i.e. Freddie Mac, Fannie Mae); government (i.e. FHA, USDA, VA); nonconforming (i.e. Alt-A, Jumbo), etc. Mortgage types (i.e., second, fixed, adjustable, balloon, reverse); Home Equity Line of Credit (HELOC), etc. Form 1003; application accuracy; verification; closing disclosures, etc. Processing and underwriting; assets; income; liabilities; credit reports; qualifying ratios; repayment, etc. Title and title insurance; settlement; fees and explanations, etc. Periodic interest; down payment; loan-to-value rations; debt-to-income ratio; discount points; ARMs, etc. Violations; prohibitions; fairness in lending; fraud; predatory lending, etc. Borrower handling complaints; company compliance; consumer relationships; truth in marketing; borrower education, etc. State mortgage regulatory agencies; license law; licensee qualifications; NMLS requirements; compliance, etc. Now that you know the expectations, objectives, and general content of the NMLS Loan Officer exam, what comes next? The best way to pass the NMLS Loan Officer exam on your first attempt is to thoroughly prepare using the best test preparation materials available. 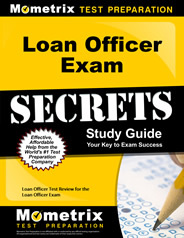 To help you succeed, Mometrix Test Preparation has designed the Loan Officer Exam Secrets study guide. The Loan Officer Exam Secrets study guide includes real NMLS exam content, along with helpful tips to reduce test anxiety, improve recall, and enhance test performance. 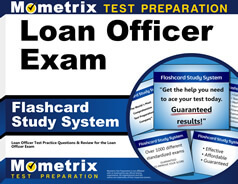 In addition to the Loan Officer Exam Secrets study guide, Mometrix offers a comprehensive Loan Officer Practice Test and a complete set of Loan Officer Exam Flashcards. Read the Loan Officer Exam Secrets study guide, test your knowledge with the Loan Officer Exam Flashcards and Practice Test, and pass the NMLS National Test on your first attempt.